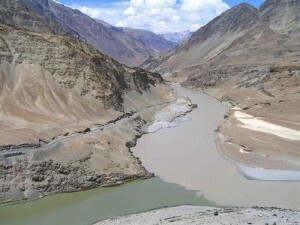 The Virgin Vale about 20 km southeast of Rangdum stands the Pazila water shade across which lies Zanskar, the most isolated of all the trans-Himalayan valleys. The Penzila top (4401 mts.) is a picturesque tableland adorned with two small Alpine lakes and surrounded by snow-covered peaks. 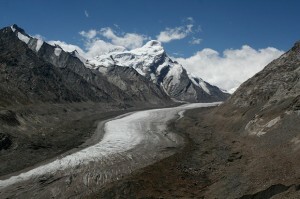 High-rise mountains surround Zanskar and deep gorges. 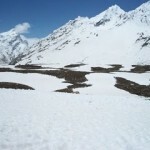 The area remains inaccessible for nearly eight-months a year due to heavy snowfall resulting in closure of all the access passes, including the Panzila. Within the mountain ramparts of the lost Shangrila stands a number of ancient yet active monastic establishments. The 240 km long Kargil-Padum road of which the first 90 km stretch only is paved, remains open from around mid July to early November. Road: The J&K SRTC operates a thrice-weekly bus service from Kargil. Penzila Pass: Approx. 20 km southeast of Rangdam at an altitude of 4401 mts., stands the Pazila water shed across which lies Zanskar, the most isolated of all the trans-Himalayan Valleys. Padum: Padum, at an altitude of 3505 mts, is the present-day administrative headquarters of the region. Its old part comprising inter-connected abode houses and several high-rise chortens surrounds a boulder-strewn hillock, site of the erstwhile palace and fort. The new, up coming township is fast encroaching upon the cultivated expand downwards, and a small bazaar is coming up along the newly built road. Padum has become famous as a major trekking base and a popular tourist destination.Several places of tourist interest in the vicinity of the township can be visited in the course of entertaining walks. The nearest monument is a set of ancient rock curving on huge boulders near the bank just below the old township. The Stagrimo monastery with a tree-covered ridge above the old town, at an hour’s uphill walk, along flower-strewn lush green hill slopes. The old village of Pibiting, dominated by its picturesque hill top monastery, a supper manifestation of stupa architecture. 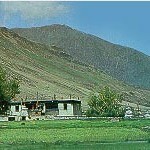 Sani: This picturesque village is 6 km west of Padum, on the road to Kargil. The chief attraction here is the castle-like monastery, which is built on level ground. The main building comprises a huge multi-columned central prayer hall housing and array of statues of popular Buddhist divinities and Drugpa (old school) high saints. The most interesting frescoes can be seen in a small, almost discarded chapel at the back of the main building, whose walls are adorned with stucco murals depicting landscape and floral designs. Adjoining this monastic complex is an old cemetery surrounded by a ring of ancient rock curving, which reflects Indian artistic influence. Stongdey: Perched on a rocky outcrop overlooking the Oasis-like village below, the picturesque monastery of Stongdey lies 18 km to the North of Padum on theroad leading to Zangla. 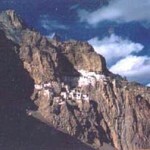 An old foundation associated with the Tibetan Yogi, Marpa, Stongdey is now second largest monastic establishment of Zanskar. Residence community if about 60 Gelukpa Monks. It can be reached by foot in about 4 hours along the recently laid rough road. Karsha: The largest monastic establishment of Zanskar, Karsha Gompa is an imposing complex of neatly whitewash adobe blocks comprising several chapels, besides residential rooms for its nearly 150 resident monks. Other places of interest in the Karsha area include an old Nunnery called Dorje Dzong, occupying a hilltop to the west of monastery. The present complex was founded during the 14th century. An old stupa surviving among the ruins is still adorned with the original mural reflecting Indian artistic influence. Nearby the ruins is the old temple of ‘Chukshik-jal’- the patron deity of Tibet. The smoke covered wall frescoes here are the finest example of Himalayan artwork. 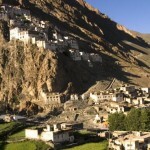 Bardan: 12 km south of Padum, Bardan is an isolated monastery with about 40 Drugpa (old school) monks in residence. The large assemble hall around which all other structures are organized, contained beautiful statues of Buddhist divinities and small stupas in clay, bronze, wood and copper. Nearby is the smaller monastery of Muney, also worth a visit for appreciating its art treasures. Zangla: Lying deep in the northern arm of Zanskar at the end of the 35 km long rough road from Padum. The old castle now in ruins except for a small chapel, occupies a hill, overlooking the deserted valley below. An old monastery situated in the nearby village of Tsa-zar has exquisite frescoes that should not be missed. Zangla is also the take-off point for the Padum-Lamayuru and the Padum-Markha valley treks. Phugthal: By the far most spectacularly located monastic establishment anywhere in Ladakh the Phugthal complex spill out of the mouth of a huge cave high up in the sheer mountain face of a lateral gorge through which a major tributary of the southern Lungnak River flows. Phugthal is accessible from the Padum-Manali trekking route through a 7 km long trail that branches off from the Purnui Bridge on the main train. A visit to Phugthal, including Bardan and Muney monasteries enroute, makes a good 5-days round trek from Padum. Zongkhul: The other spectacular cave monastery of Zanskar, Zongkhul falls on the Padum-Kishtwar trekking trail, just before the ascent to the Omasi-la Pass begins. Situated like a swallow’s nest on the rock face of the Ating Gorge, the monastery is associated by legend with the famous Indian Yogi, Naropa. The two caves around which the present monastery has developed are said to have been used by the famous Yogi for solitary meditation. The frescoes on the cave wall are very old and reflect a high degree of artistic achievement. This entry was posted in Jammu & Kashmir, Valleys, Zanskar Valley and tagged Bardan, himalaya valley, india valley, Karsha, leh zanskar, Padum, padum zanskar, Penzila, Penzila Pass, photo zanskar, Phugthal, Sani, Stongdey, Zangla, zanskar india, zanskar ladakh, zanskar photos, zanskar trek, zanskar trekking, Zongkhul. Bookmark the permalink.